The Los Angeles Rams and Denver Broncos met in the second week of the 1979 season on a Thursday night. The Rams opened the season with a loss to the Oakland Raiders 24-17 while the Broncos defense looked awesome shutting out the Bengals 10-0. The game was played at Mile High Stadium before 76,000 Bronco fans. It would be a defensive battle between two of the best defenses in the NFL. There were over 19 punts between the two teams. The Rams only points in the first half was two Frank Corral field goals. 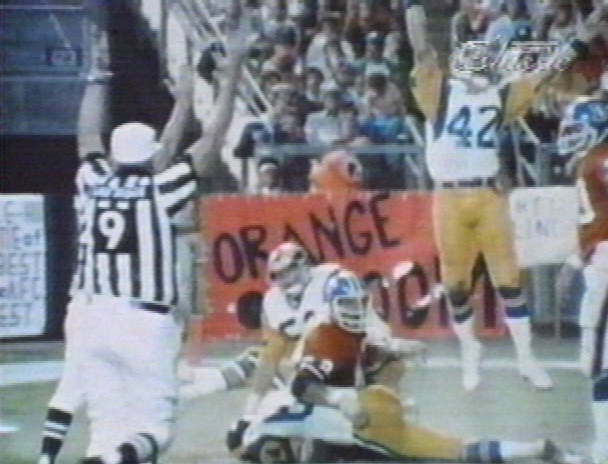 With the Rams on their own two yard line, the Broncos scored a team safety as Dennis Harrah was caught holding in the endzone.The halftime score was 6-2 Rams. Late in the third quarter the Broncos had their best drive of the night taking the ball all the way to the Ram 7 yard line. On a 3rd and goal, the Broncos ran the ball as RB Dave Preston scored a TD making the score 9-6 Broncos. Even though the Ram offense passed for almost 200 yards, they couldn't get a drive going. The defense would have to step up. With less than 6 minutes left in the game the Broncos had a 2nd and 8 on their own 12 yard line. As QB Craig Morton went back to pass, Dave Elmendorf on a safety blitz leveled Morton who fumbled the ball. Jack Reynolds picked it up and with Bob Bruzinski making the key block, paved the way for Hacksaw to literally crawl in the endzone for a touchdown, giving the Rams a hard fought 13-9 win. Just as it has done so many times over the last 7 years (73-79), the Ram defense won this game.